This week, our featured artist is three piece emo rock group Hora Douse from Leeds. While they only have a few tracks currently out, Hora Douse have done a fantastic job at laying down the framework for future releases with their inventive, unique sound. Continue reading to learn more about their music, find out when they're playing at FEST, and check out an interview with vocalist / guitarist Tom Lee. Their 2014 EP, Crash, is composed of three tracks. The title track, "Crash", immediately hits you with a fast rhythm that remains more or less constant, paired with a catchy chorus. In particular, the line "I'm falling apart / so I can fall in line" stands out for the effective yet simple lyricism that's evident throughout the rest of the EP. The energy doesn't stop as Hora Douse move into their second track, ""Bored", which starts off with a fuzzed out vocal filter and continues into what can only be described as a straight up punk rock track -- no frills, no sugar coating, just plain and simple honesty. 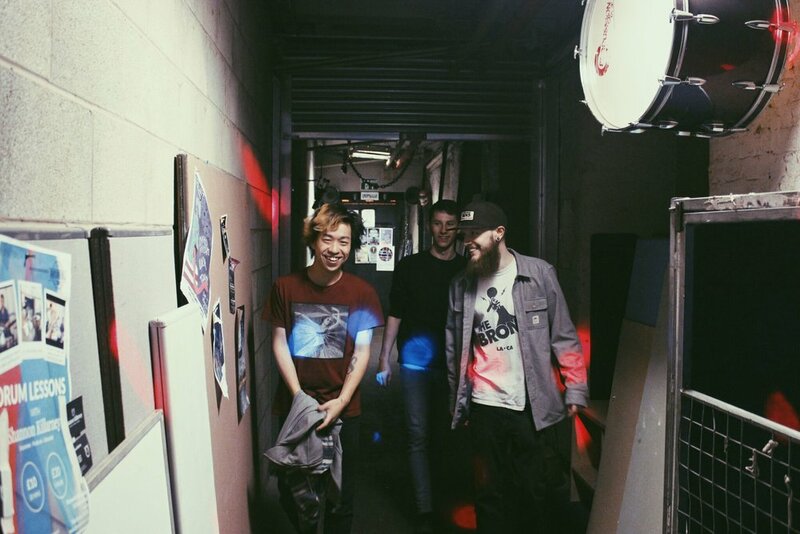 Closing with "Speak", you're greeted with laid back vocals that are accompanied by quiet instrumentals. As the song progresses, the sound grows heavier, until you're completely enveloped in the noise-- crashing drums, roaring guitars, and a sense of fullness. As the track comes to an end, the music fades out into silence. Although short, this EP doesn't come across as lacking in the slightest, except for the fact that you'll most likely want to hear more once it's over. Musically, however, it's a complete package. You can listen to Crash Bandcamp, and stay up to date with them on Facebook. 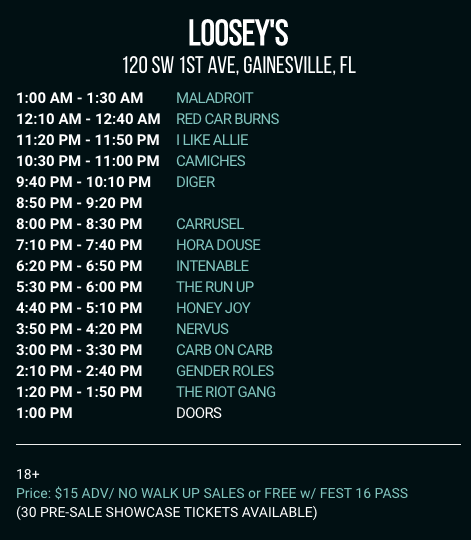 Hora Douse are playing FEST on Sunday, October 29 2017 at Loosey's from 7:10 - 7:40 PM. You can view the full FEST schedule right here! I asked Hora Douse's Tom Lee a few questions about their writing process, FEST, and more. Check out their answers below! Q: As first time FEST-ers, what are you looking forward to the most? A: Everything! It’ll be our first time collectively in the States too, so I think we’re all just looking forward to being there, seeing some of our favourite bands, and hanging out with everyone! We have a lot of friends, who have flown over before for FEST, and they tell us how they have the absolute best time, pretty unanimously, so it’s just a total privilege to get to fly over to play to anyone. I’m looking forward to pigging out, I hear food in Gainesville is amazing! Q: What is your writing process like when creating new tunes? A: Writing is sporadic since we all live in different cities in the UK now, and I've been working and living sporadically in different countries for the last two years! I write all the songs, and then whenever we’re able to get together, we flesh out the ideas in a room. I usually come with a rough idea for the bass and drum arrangements, but the other guys are the ones who lock the songs in place. Q: What has been your favorite venue to play a show at so far? A: My favourite venue is the Brudenell Social Club in Leeds, although we’ve never actually played there together! I’ve done solo sets there, opening for Listener and Tim Kasher. The sound is always incredible, and it’s my favourite place to see a band. It’s intimate, and just a great place to hang out, even if there’s nobody playing. I’ve seen so many incredible bands perform on that small stage, including Superchunk, Shellac, Cursive, The Julie Ruin, Kevin Devine, Touché Amoré, etc. The last venue we played at, also in Leeds, called Hyde Park Book Club, is another great new space. It’s a small room with no real stage, but there’s something really sweet about playing floor shows. They do great vegan sandwiches too! Q: What bands are you looking forward to seeing at FEST? A: So, so many! There are a few pals from this side of the Atlantic who are flying over too, and it’s always a pleasure seeing our friends in Apartments, Anna’s Anchor, and Kamikaze Girls. I’ve gotten to know a bunch of U.S. bands from them touring here in the UK too, and I’m really excited to see Bike Tuff, Beach Slang, Drug Church, and Slingshot Dakota again. We’ve never seen Against Me! so that’ll be an incredible moment, especially with Reinventing Axl Rose in full, and there are a ton of bands we wanna tick off our bucket list - Pkew Pkew Pkew, Rainer Maria, The Movielife, Crime In Stereo, Teenage Bottlerocket, Worriers … we can go on and on!